PoPville » Peregrine Espresso Turns 9 Today – Celebrate with Free Coffee All Day! Peregrine Espresso Turns 9 Today – Celebrate with Free Coffee All Day! Locations are 660 Pennsylvania Ave SE, 1718 14th Street, NW and in Union Market at 1309 5th Street, NE. 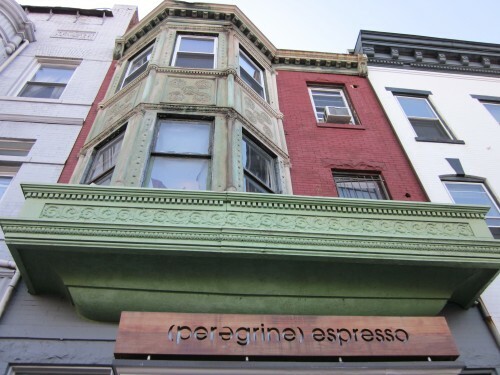 “Peregrine Espresso was founded in 2008 by Ryan and Jill Jensen with the hope of serving great coffee to the people of Washington, DC, accompanied by great service, education and a focus on sustainability. The couple met while working at rival cafes but soon knew they would open their own after they were married. The Eastern Market cafe was their first baby, followed by a baby boy, then MidCity, Union Market, and another baby boy. Ryan continues his 15+ year coffee career shuttling between stores, intimidating staff and wrangling shop managers. Jill helps out with admin and special projects when not wrangling their boys.